Like a kinder, gentler Battle Royale… IN SPACE! 1955’s Tunnel in the Sky takes us to a future Earth jam-packed with people but rescued from an ongoing Malthusian crisis by the timely invention of interstellar gates. With access to the hundred thousand Earth-like worlds1 scattered through the Milky Way, there is enough room for everyone to spread out while breeding like mice, at least for a time – I make it about 600 years before all one hundred thousand worlds are as crammed with people as the Earth is. There are many interesting ways people can die on worlds like Earth and to avoid unnecessary recapitulations of Jamestown, Fort San Juan and Popham, the powers that be, at least in the west, have mandated survival courses. The final test for the course involves dropping a class full of kids into a wilderness on some far off world to see how many come back. It’s like Battle Royale IN SPACE!, except without the official mandate against team work because the adults, while sometimes obstructive or casual about risk to teens, are not out and out psychopaths. At first Rod Walker and his fellow students appear to face only the usual challenges: finding edible food, avoiding being edible food and dodging whichever classmate it is who settled on the idea of hunting their classmates for their useful stuff. Rod enjoys only mixed success at this: it turns out testing the local food for edibility by eating it isn’t a great idea, the local carnivores don’t quite manage to eat him but they leave scars and the only reason that Rod survives his encounter with the class sociopath is that Rod’s head is quite astoundingly thick. There’s an unanticipated angle to the test, as the dwindling pool of kids discover. The test is only supposed to last from two to ten days before the survivors are retrieved. At the end of the ten days no gate back to Earth opens and as days turn into weeks it becomes obvious that if rescue is coming at all, there is no predicting when it will arrive. Almost by chance Rod and his chums Jimmy and Jack are the seed for a community of survivors. As their numbers grow, so does the complexity of the issues they face, from simple logistics to politics to defense against the local wildlife. Although this long stay was never planned for, their training is good enough and the general good will effective enough that the kids are able to fumble their way towards a functioning, if primitive, community of sedentary hunter-gatherers. That process towards a working society is what this novel is about. Not to be too harsh on poor Rod but while he’s not the dullest Heinlein protagonist, he may well be the dumbest. In addition to discovering the hard way that some local plants are purgatives, narrowly avoiding getting eaten and living through an ambush only because apparently his head is not a vital hit location, Rod also fails to notice one of his teammates is a woman despite having wrestled with her until after he delivers a misogynist diatribe and after the indefensible nature of the town’s location nearly leads to a total party kill invokes the sunk cost fallacy to justify not relocating to a superior location. here each family had its own wagon….long, sweeping, boat-tight Conestogas drawn by three-pair teams and housed in sturdy glass canvas square and businesslike Studebakers with steel bodies, high mudcutter wheels, and pulled by one or two-pair teams. The draft animals were Morgans and lordly Clydesdales and jug-headed Missouri mules with strong shoulders and shrewd, suspicious eyes. Dogs trotted between wheels, wagons were piled high with household goods and implements and children, poultry protested the indignities of fate in cages tied on behind, and a little Shetland pony, riderless but carrying his saddle and just a bit too tall to run underneath with the dogs, stayed close to the tailgate of one family’s rig. The crowd streaming through the pen were Asiatics- Japanese, Indonesians, Siamese, some East Indians, a few Eurasians, but predominantly South Chinese. To Rod they all looked much alike- tiny women with babies on hip or back, or often one on back and one in arms, endless runny-nosed and shaven-headed children, fathers with household goods ill enormous back packs or pushed ahead on barrows. There were a few dispirited ponies dragging two-wheeled carts much too big for them but most of the torrent had only that which they could carry. As well, the justifications for why the American settlers equip themselves for a 19th century society are not convincing. By choosing that toolkit, they are limiting their productivity to 19th century levels, which is going to make ramping up to modern levels of prosperity that much harder. But Americans are nostalgic for the 19th century. Ortega’s torch ships brought the Solar System within reach. Based on mass conversion, Einstein’s deathless e= MC², they could boost for the entire trip at any acceleration the pilot could stand. In his defense, the bit about them having total conversion is more than a page away from the part about importing fissionables. Some authors go out of their way to handicap the supporting characters so the protagonist looks better by comparison but Heinlein didn’t to that in the juveniles and he certainly didn’t do it in this. If anything, Rod makes everyone around him look better, whether its Jack proving they are not just in Africa or Bob trying to keep everyone alive with his rudimentary medical skills. I think my favourite in this is the ingenious Caroline, who turns out to have filled a deceptively small duffel bag with Many Useful Things. Rod did so, remembered to shake hands with the Deacon. It was all right, he guessed, but- well, how old were they? Sis must be thirtyish and the Deacon… why the Deacon was old- probably past forty. It did not seem quite decent. But he did his best to make them feel that he approved. After he thought it over he decided that if two people, with their lives behind them, wanted company in their old age, why, it was probably a good thing. I am sad to say I only noticed how funny that is well after after I stopped being a teenager. Many people believe that Rod is black. The actual evidence is somewhat equivocal: Rod says Caroline, who is African, looks a bit like his sister. Aside from that, there’s not a lot of physical description in this book. The evidence is slim but definite. First and foremost, outside of the text, there is a letter in which RAH firmly states that Rod is black, and that Johnny Rico is Filipino. As to the text itself, it is implied rather than overt. RAH often played games with the skin color of his characters, in what I see as a disarming tactic against racists who may come to identify with the hero, then realize later on that they have identified with somebody they supposedly hate. He does this in a number of different places. Part of this may also have to do with the publishing mores of the time, which probably would not have let him get away with making his main character black in a juvenile novel. The most telling evidence is that everybody in “Tunnel” expects Rod to end up with Caroline, who is explicitly described as black. While that expectation may seem somewhat racist to us today, it would be a firm hint to the mindset of the fifties, which would have been opposed to interracial marriages. Sadly, not only did Heinlein have a proven track record of misremembering his own work (as shown by his confusion over whether the text of Starship Trooper supported the assertion that voting rights could be earned with non-military services) but Tunnel is pretty clear, at least to my eyes, that that the kids in it have no problems with mixed race marriages. Caroline is a bit put out that “M” marries Margery Chung because Caroline had her eye on him. While in real life names are not a reliable guide to ethnicity, in fiction they often are. Caroline is African, Chung seems to be of Chinese descent and it seems difficult to avoid the conclusion either one of the Caroline + M or Chung + M would be an interracial marriage. I guess M could be both African and Chinese but that only moves the interracial marriage in question up a generation and back to Earth. Since the majority of Americans didn’t come to see mixed race marriages as acceptable until the mid-1990s, forty years after this book was written, that minor bit of business was pretty daring on Heinlein’s part. Which kind of suggests that not all the men kiss women only. I think the facts support the idea that Rod just doesn’t have sexual urges at all and being as thick as he is, has a hard time wrapping his mind around why other people do. While women get to be as competent as the men – even pushing back when the men try to “protect them” - I am sad to say that as usual with Heinlein marriage pretty much back burners all non-baby ambitions they have. Oh, well. Having all women Amazon units was pretty progressive for the 1950s and so is eschewing the idea the women would be too squeamish to get their hands bloody. 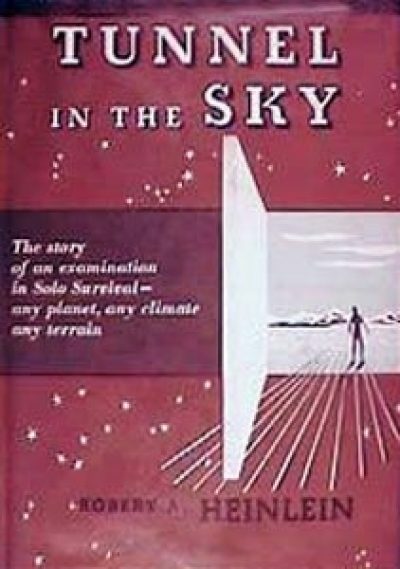 One of the recurring themes in Heinlein of this period is the vanished civilization and this book has two: one native to this world and a reference to Selenites. Where the locals went is a mystery and because the community never moves into the abandoned cliff dwellings, not one that gets any serious effort to solve. I don’t think it’s an attempt to evoke myths Americans had about the empty frontier. I wish more had been done with this part of the book. Another recurring theme in Heinlein’s young adult novels – one that will be of particular importance in Citizen of the Galaxy – is being forced to chose between incompatible goals. Rod’s decision-making process never takes much time so he is firmly resolute when it comes to deciding whether to stay in Cowpertown or accept an offer of rescue. Rod is just one person in an entire community, which lands him in another situation that comes up from time to time in Heinlein, which is how to gracefully handle not getting one’s own way. In fact, Rod gets hit with that one a few times and as much fun as I have mocking his intelligence, he does show an awareness of when stubbornness is not his ally. While the world building is sometimes shaky, and his efforts to transcend the prejudices of his time often fall short, there are some nice bits to this. Readers interested in trying it for themselves may buy it in a variety of formats, although I got bored before I managed to find a mass market or a trade I was 100% sure is still in print. Which means only one star in a million has a planet where humans can walk around, which in turn means the average distance between any two of them should be something like 500 light years?Hope the people on the sublight starships that get mentioned early on brought books for the trip.